“Why after living and working in Africa for 18 years, can’t I get used to the perception of time that a lot of people have? Why is it still a challenge to receive constructive feedback? Why is it often difficult to have open conversations when bosses are in the room? 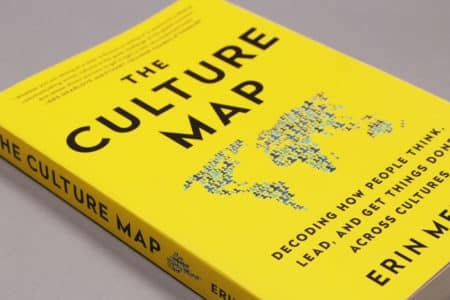 I like this book as it helps me and the groups I work with to understand cultural differences and act on them. In my work, I deal with people from different nationalities, countries and cultures most of the time. The dynamics in these multi-cultural groups are very much determined by the cultures people come from: the invisible boundaries that divide our world. This book gives a practical framework to make the differences explicit, make the invisible visible, so we can deal with it. Last month I facilitated a workshop for the Swiss Embassy in Tanzania and one of the objectives was to strengthen intercultural competencies and learn about direct and indirect communication, which is part of one of the 8 scales that represent key areas that people must be aware of according to Erin Meyer. Firstly, participants were asked to assess their own communication styles and then they had to think about how colleagues could best deal with them and how they could communicate best with colleagues who have a style that is totally opposite from theirs. This resulted in a great understanding, a very lively and rich exchange, as well as a lot of laughter about the differences and the misunderstandings this creates. The other scales are evaluating (direct negative feedback-indirect negative feedback), persuading (principles first-applications first), leading (egalitarian-hierarchical), deciding (consensual-top-down), trusting (task-based-relationship based), disagreeing (confrontational-avoids confrontation) and scheduling (linear time-flexible time). The book provides many examples that I recognise. As a Dutch person working in Africa most of the time, it made me realise again how often my way of behaving is culturally determined and unconsciously guiding me in the way I deal with groups. So often I feel like we are coming from different planets. And so often do my participants assume that I understand where they are coming from. Last week, I had a workshop starting at 8.30 AM. The evening before, the manager decided to shift it to 9 AM without informing me. Some people came in at 9 am, some at 9.30 and at 10 am we were finally complete. I was the only one who felt extremely frustrated. Although I know it has nothing to do with me or respect for me, I feel disrespected. Even when I shared this, it seemed to be more my problem than theirs, although one of the things they want to change in their team is being on time. The book helps me and the groups I work with to become aware, understand and talk about it in a respectful and light manner. So no matter who you are working with or where that person is coming from, you should begin any relationship with the desire to understand what is specific and unique to that individual……….As leaders we need to be prepared to understand a wider, richer array of work styles then ever before and to be able to determine what aspects of an interaction are simply a result of personality and which are a result of differences in cultural perspective.